How do you, as a busy security executive or manager, stay current with evolving issues, familiarize yourself with the successful practices of your peers, and transfer this information to build a knowledgeable, skilled workforce the times now demand? With Security Leader Insights for Effective Management, a collection of timeless leadership best practices featuring insights from some of the nation’s most successful security practitioners, you can. This book can be used as a quick and effective resource to bring your security staff up to speed on topics such as the characteristics of effective security leaders and programs, leading through difficult times, budget issues, and aligning security with business goals. Instead of re-inventing the wheel when faced with a new challenge, these proven practices and principles will allow you to execute with confidence knowing that your peers have done so with success. 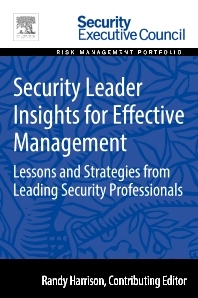 Security Leader Insights for Effective Management is a part of Elsevier’s Security Executive Council Risk Management Portfolio, a collection of real world solutions and "how-to" guidelines that equip executives, practitioners, and educators with proven information for successful security and risk management programs. Part 1: What Do Effective Security Leaders and Programs Look Like? Lance Wright, Senior Vice President, Human Resources and Administration, USEC Inc.
Joe Nelson, Former Director of Corporate Security, Teradyne Inc. Phase One: What Do You Have to Work With? Phase Two: What Should Your Mission Be? Phase Three: Where Do You Stand? Chapter 17. How Will Business and Risk Drivers Impact Your Mitigation Strategy? Trend #2: Is Risk Scrutinized or Overlooked? Randy Harrison currently directs the security program for Delta Air Lines, Inc. global network serving roughly 165 million passengers annually to over 322 destinations in 59 countries with almost 80,000 employees. Harrison has worked for Delta for 24 years in varying capacities and has progressed through increasingly responsible positions while demonstrating leadership, skilled management and the ability to deliver on promised results. He is skilled in strategizing, developing and implementing complex programs to mitigate varying types of corporate risk (safety, health, environmental, security, business continuity and emergency response), and developing a competitive advantage by contributing to the bottom line. Under Harrison’s leadership, the security program has been elevated to the CEO and Board Committee level as a recognized element of the overall enterprise risk model with corporate measures and reporting criteria.